That the 1911 series of handguns remains one of the very favored by shooters for self-defense is evidenced in the prolific number of companies making essentially the same pistol, albeit in wide variations. Many, myself included, believe that this pistol is the yardstick by which other defensive arms are measured. One popular version of this “yardstick” is the Commander. In other writings, one will see the term “combat accuracy” used, often when a gun just flat doesn’t group. Feel free to disagree, but I have little use for a “combat accurate” pistol. I want an accurate one. For me, “accurate” doesn’t mean that it has to shoot groups worthy of respect at Camp Perry, but it does mean that I cannot outshoot the capabilities of the pistol. If I can outshoot it, I don’t want it. That’s simply my standard and certainly may not be yours. Whether or not a particular arm is “meant” for shooting paper or not, I think it is important to be able to make the thing group if for no other reason than to see what can be expected under calm conditions in the hands of a reasonably fair shot. It might give some kind of “benchmark” by which to judge how well one might or might not do with this type arm under the stresses of a defensive scenario. 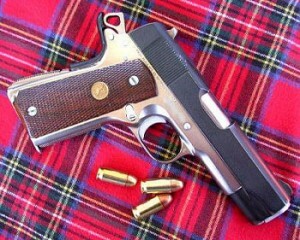 The Pistol: This pistol is a personally-owned Colt Commander bought in the early ’80s from a friend. It has been customized to meet my perceived needs in a defensive pistol. Gone are the smallish, military fixed sights; they’re replaced with a melted King-Tappen rear sight and a serrated ramp front sight, silver soldered to the slide by gunsmith, Lou Williamson. It’s been zeroed by me @ 15 yards for Winchester 230 gr ball. Customized Commander from the front.... Those are not nicks and scratches, but residue. Picture taken after some shooting was done. Lou fit a thicker than normal bushing to the slide and bbl of the pistol. He left the bbl 0.582″ for the last quarter-inch the bbl, but turned down the rest to 0.571″ so that the bushing’s fit was really tight only for the last quarter-inch of lockup. 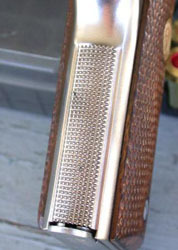 The gun’s aluminum frame had the frontstrap checkered 20LPI as is its aluminum, arched mainspring housing. Originally, the short Commander grip safety was replaced with a dished-out GI, but I replaced this with a Pachmayr beavertail and a stainless, lightweight hammer from Springfield some years later so that I’d not have to have the E-nickled frame refinished after having a wide grip safety fitted. On this gun, I prefer the short trigger and arched M/S housing. The slide was black parkerized while all other steel parts were hard-chromed. Stocks are the originals, but have been refinished a time or two over the years. The trigger on this pistol breaks at a clean 4lbs or slightly less and it’s been shot MUCH over the years. The magazine well has not been beveled. Others may disagree, but I felt on my gun, it could lend itself to cracking as it thins the aluminum too much. Here's a view of the "melted" rear sight and the Pachmayr grip safety. 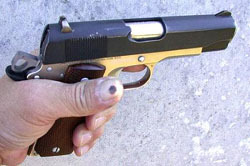 This gun also has a standard, Colt thumb safety. The brownish color of the sight's just the way it came back to me. 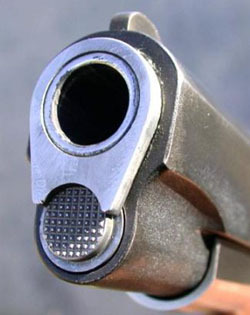 Ammunition: Today, the pistol was fired with 4 different rounds. 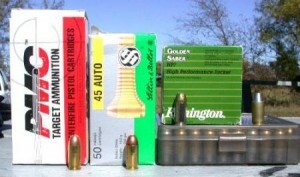 One was a 200 gr handload while the other three were all in 230 grains. Two of these were FMJ with one being a standard pressure JHP. Shooting: Today’s shooting was done at 10, 15, 25, and 50 yards. The 10 and 15 yard groups were fired w/2-hand hold from a standing position. 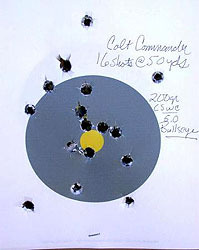 The 25 and 50 yard groups were fired seated and with my wrists rested. 10 Yards: Four sets of controlled-pairs were fired from a low ready position. This was not timed, but done as quickly as I could get a “flash” sight picture. I’d estimate roughly 1-sec per shot. I make no claims at being any kind of speed shooter and leave the “practical” critiques of this arm to those more qualified. I do think that one can easily defend himself with this pistol. 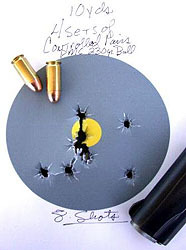 15 Yards: These slow-fire groups consist of 5 shots each. The gun shoots tighter than I can as evidenced by the errant shots. 50 Yards: Again, two complete “gunsfull” of the handload were fired at this distance. My shooting’s not the greatest and I do believe the pistol will do tighter than what’s displayed. Observations: The very things that make this pistol great for lawful defensive carry work against it for a range gun to be used on paper. 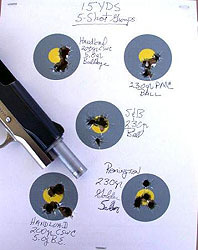 The shorter sight radius compared to a Gold Cup and the lighter overall weight make getting tight groups a bit more difficult than with those 1911s with steel frames, target sights, and so forth. However, the pistol is not “bad” at the range. While felt recoil is very subjective, I think many might be surprised at how little the Commander kicks relative to a full-size steel gun. To me, recoil’s sharper and there is a bit more muzzle flip, but it’s much more pleasant than full-house .357s out of a K-framed revolver. Frontstrap.... The Commander's an easy to carry, comfortable pistol. I will provide chronograph data from this 4.25″ barreled pistol with loads I’ve chronographed from the 5″ guns. Difference is usually not great, but can really begin to drop off with the 3.5″ or shorter barreled 1911s. I prefer not to go under 4,” but others prefer the shorties. To me, from the holster, the Commander’s extremely quick to bring to bear on a target, quicker for me than an all steel full-sized gun or a Browning HP. 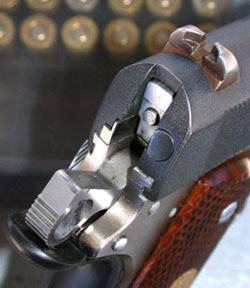 The feed ramp on this pistol was “throated” as the original configuration was only for ball. It was e-nickeled with the rest of the frame and has held up very, very well. However, I do recommend that users of these aluminum-framed 1911s use only ball, CSWC, or JHPs having rounded ogives to avoid gouging or denting up the softer-than-steel frame portion of the feed ramp. 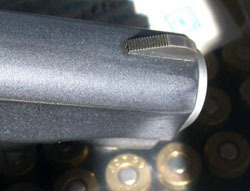 One’s also well-advised to use magazines that don’t let the round’s “dip” and feed straight against the ramp. Though common now, the ejection port was lowered and "scalloped" by gunsmith, Lou Williamson. The question always comes up about aluminum’s longevity. I don’t believe it to be as long as steel in most cases, but with standard pressure loads, a proper recoil spring (I use 18.5lb), and perhaps a buffer, frame life can be long indeed. I can only estimate the number of rounds fired in this particular Commander at about 15 to 20 thousand. This one’s made an excellent self-protection pistol and is one I can recommend for the shooter willing to practice. 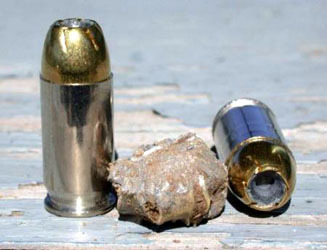 Left to Right: PMC 230 gr ball, S&B 230 gr ball, Remington 230 gr Golden Saber, and a 200 gr CSWC loaded over 5 grains of Bullseye. Oh, yes. 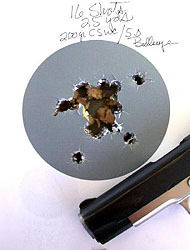 The “scientific mud expansion test” result with Remington’s Golden Saber in 230 grains…. I’ve used this gun in law enforcement both as a primary and backup pistol and have toted it for several years off and on. I think I’ll keep doing it. Copyrighted by Stephen A. Camp, 2002. Article used by permission of the author.